Raise your hand if you A) are from the Midwest, B) have ever been to a church or community potluck, or C) have eaten at your grandmother’s table. Hand raised on all three. If you answered yes on any one of these, you’ve likely experienced a 7-layer salad. Say hello to its vegan cousin. This recipe was actually a reader request, and seeing as I just mastered Vegan Mayonnaise and Coconut Bacon (and Eggplant Bacon), I figured it was perfect timing. 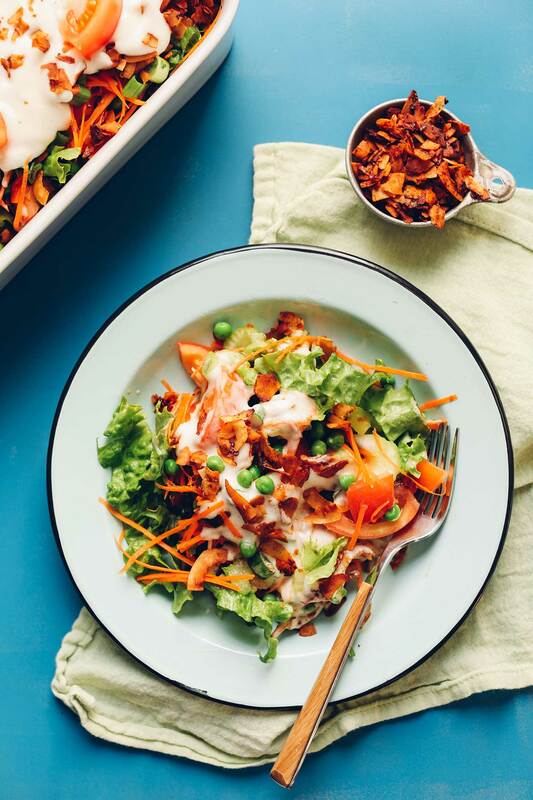 My version mimics the traditional version, only it subs carrots for cheese, coconut bacon for bacon, and naturally sweetened vegan mayo dressing for mayonnaise and sugar. Did I mention that this is a 30-minute, 10-ingredient recipe? Because it totally is. This would make the ultimate side dish to bring along to parties or group dinners. It would pair especially well with entrées like my 1-Pot Red Lentil Chili, Chickpea Sunflower Sandwich, or Curried Potato and Lentil Soup. For more salad ideas, check out my Garlicky Kale Salad with Crispy Chickpeas, Creamy Kale Salad with Chickpeas & Shallot, 20-minute Asian Kale Salad, Blissed-Out Thai Salad with Peanut Tempeh, White Bean Kale Salad with Tahini Dressing, or Tahini Kale Salad with Kumquats. A modern twist on a classic salad. 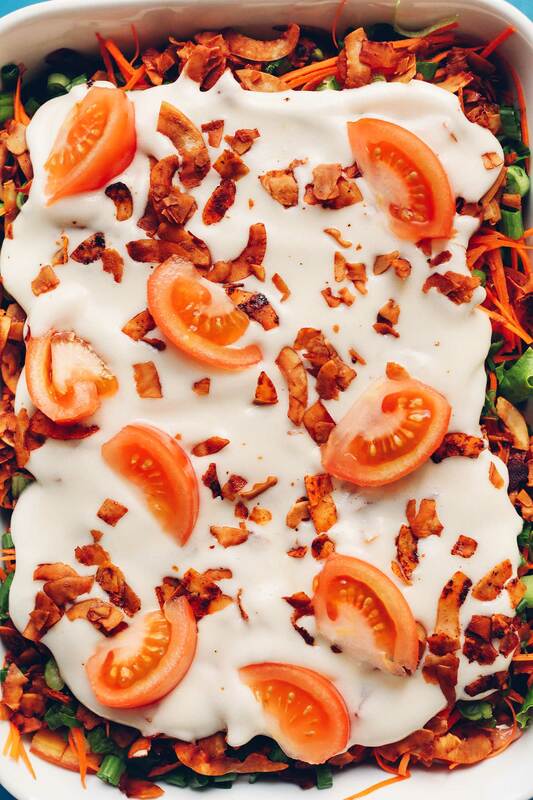 Veganized 7-layer salad with fresh vegetables, crunchy coconut bacon, and vegan mayonnaise dressing! Add peas to a small saucepan (in a steamer basket if you have one) with a splash of water and heat over medium-low heat until just thawed and warmed through (but not cooked) - about 2-3 minutes. Then drain off any excess water and transfer to a small bowl. Set aside. To a large serving dish (I used this one in white), add chopped lettuce. 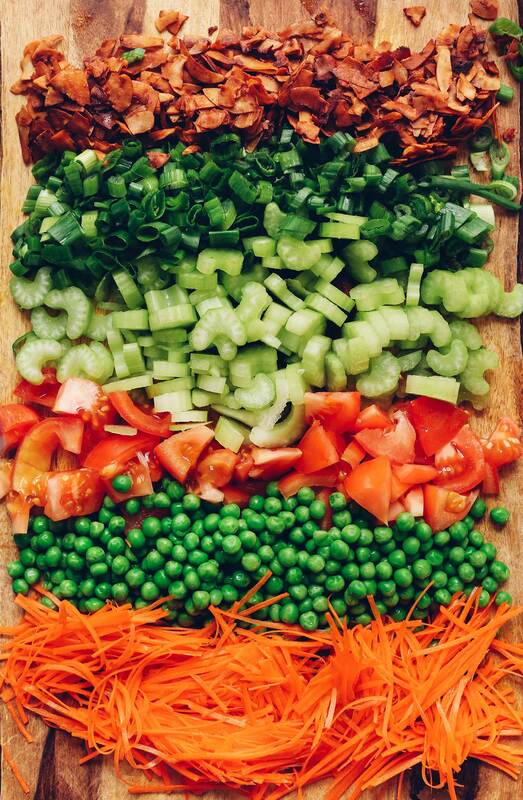 Then top with celery, peas, tomatoes, shredded carrots, green onions, and coconut or eggplant bacon. Set aside. To a medium mixing bowl, add vegan mayo (homemade or store-bought), lemon juice, and maple syrup. Whisk to combine. Taste and adjust flavor as needed, adding more lemon juice for acidity or maple syrup for sweetness. Top the salad with all of the dressing and use a spoon to smooth into an even layer. 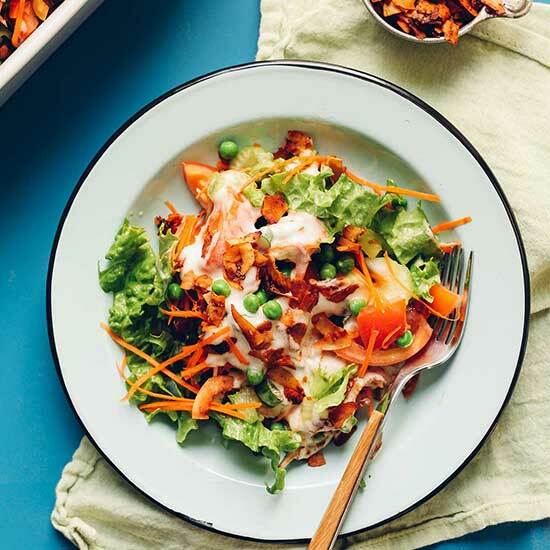 Optional: top with more coconut bacon and vegetables, such as tomato or green onion. You can enjoy this as is or cover and refrigerate up to 4-6 hours. Store leftovers (dressing separate from salad) in the refrigerator up to 3-4 days, though best when fresh. Dressing will keep up to 1 week. *If you're looking for an alternative to the vegan mayonnaise dressing, try my Tahini Dressing and omit the garlic. I haven't tried it on this salad but imagine it would work! *Recipe loosely adapted from Pioneer Woman. Made this for Thanksgiving today and WOW! Whisks me right back to my childhood. I ended up tossing it because I forgot to add the “bacon” before the dressing, but tastes exactly as I remember my Midwestern great aunts making it. Awesome to revive an old family fave in vegan form and my littles are obsessed with the coconut bacon! Not a fan. Way too much dressing, and I used a large head of lettuce. Typically love your recipes tho. Made this tonight with dinner. We all loved it! Definitely on the “make again” list! My family of four are newish vegetarians (2 of them picky teenagers) and I’m gluten free. It’s a challenge! Finding your site with all the awesome recipes, that are so quick and easy, has been awesome!! Thank you so much for this wonderful recipe! It was absolutely delicious! I prepared it for our Thanksgiving meal. I was amazed how tasty the coconut bacon was! I was a bit disappointed with the aquafaba mayo recipe. It didn’t thicken well and the grape-seed oil tasted a bit strong to me. I threw that away and went with the soy-free vegenaise option and added garlic, dill, paprika, and pepper. Keep those vegan recipes coming! I also used coconut aminos instead of tamari. Perfect! I made this last weekend and it was great. The coconut bacon was so addicting I had to make more. My daughter has requested to have this every week lol. Made this tonight and it was refreshingly delicious! My boyfriend and I both had seconds :) The coconut bacon adds the perfect touch! Thank you. this looks great! would this work ok in a regular ol’ 9×13 pyrex? or would you recommend maybe making more to fill a 9×13? Hi Colin! That should work! 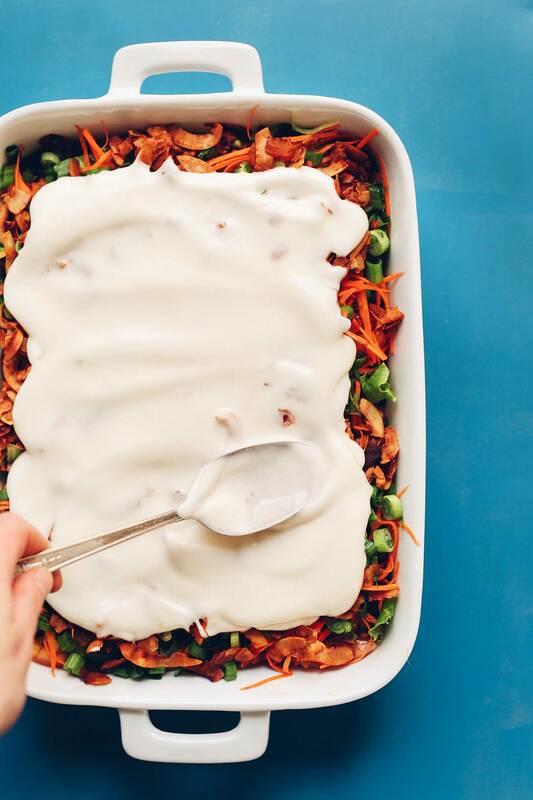 You may find that you’ll want to add more veggies to fill it up a bit, but it’ll be pretty close to what we used! Good luck! Hi Durga! You’re in luck! The “bacon” in this recipe is entirely plant-based. This one would work well also! What a simple and interesting combination for a dressing. I will try this! Wow – this takes salad to another level! The batch of your aquafaba mayo says it makes 1 cup, but this recipe calls for 2C mayo or 1 batch aquafaba mayo. So 1 or 2 cups for the salad recipe? Thank you I am looking forward to making it. Good question! I miscalculated there on my yield :D Fixed to suggest 1 1/2 batches (1 1/2 cups) vegan mayo! Hi! I haven’t heard of that but I’m not surprised! Let me know how it is if you give it a try. Hi, I love your salad recipe. Could I ask, what do you use for shredding carrots? I like the way they are shredded. Yes! I love using the grater attachment on my Food Processor! Oh my gosh! I’m a midwesterner and still make 7 layer salads, but they are junkier with store-bought vegan mayo and Daiya shredded cheese. I am excited to make your version, thank you! I love that coconut bacon recipe! So addictive! Whoop! Let me know how it goes!! Question, does your vegan mayo sink when stored because it’s made from aquafaba? Mine doesn’t! Especially if you use the method I recommend which uses all of the oil (not the low-fat version). This looks so yummy! Thanks for the inspiration, will have to try this week. I wanted to let you know that my husband and I have made so many of your recipes from your blog and cookbook and everything has turned out fabulous.